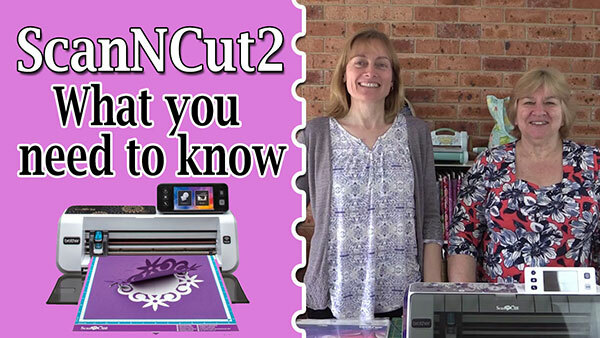 With the release of the new Brother ScannCut2, we thought we would write up a quick post to help you decide whether to upgrade to the next model or keep your existing Scan n Cut. The first and most important thing you need to know is that depending on what country you are in, there is more than one version of the new Scan-n-Cut-2. In the US there are two versions and in Australia there are 3 versions! This is going to be a little confusing for a lot of people as I don’t think many know this and will proceed to go ahead and purchase the cheaper model, not realizing that there is another version that has all the fabulous features that Brother is promoting in their videos on YouTube. In fact, we were about to do this ourselves. On Amazon the new Scan-n-Cut is available for pre-order as of the date of writing this blog post. I thought great, we can buy it (and they even post to Australia) but after a bit of research, I realized this wasn’t the version with all the bells and whistles. I’ve already noticed a number of people in the US saying they have purchased the ScannCut2 from HSN but I wonder whether they understand that there are two different versions. There isn’t a huge difference between the two but if you are looking for a particular feature and you don’t realise that the cheaper model does not have that feature, then you may be disappointed. The CM350 is the one that is being released to HSN, Amazon, Walmart and Jo-Ann’s. It’s the version that is selling for $349US and does not have all the new features. The CM650 version sells for approximately $629US and is available for sale at smaller specialized retail outlets. Try your local fabric store or sewing machine stores for instance. So how do they compare to each other AND the older models? Larger Screen: Both the new CM350 and CM650 have a larger screen – 30% larger than the older models. Wireless Ready: What this basically means is that you can now transfer cutting files from ScannCut Canvas directly to your machine and vice versa. This is a new feature and is included in both the CM350 and CM650. However, you need an activation card to get it all working and that is only included with the CM650. If you want to get the activation card for the CM350 it will cost you an extra $49.99 US. Direct Connection via USB Cable – This is a new feature included with both the CM350 and CM650. It allows you to connect your computer to your ScannCut2 machine using a USB cable. However, the USB cable is not included for either model. Built in Designs – There are a few new designs compared to the older models. The CM350 has 631 designs and the CM650 has 1102 designs. Scanning Color Recognition – This is a new feature and is available on both the CM350 and CM650 models. It will be interesting to see how this compares to the older versions but essentially you will be able to choose between grayscale or RGB color mode when scanning. 12” x 24” Scanning Capability – This feature is only available on the CM650 model. It’s what we have been waiting for which is why we will be buying the CM650. We have been wanting to scan using the 12” x 24” mat we have but our current Scan n Cut machine will only scan using a 12” x 12” mat. SVG Files – This is a great new addition and is available on both the CM350 and CM650 models. Now you will be able to import SVG files into your machine without having to convert them first. PES Files – If you have an embroidery machine that accepts PES files then you will love this feature as the ScannCut will now read files containing stitch data. However, it is only available on the CM650 model. Universal Pen Holder – Brother have also been playing a video on their channel that shows a new Universal Pen Holder. We have since purchased the pen holder and it works for all models of the ScanNCut. You can read more about the Universal Pen Holder here. We ended up going going with the CM650 (which in Australia is the CM900). Why?…because the CM350 really doesn’t have enough value added features for us to want to rush out and buy one to replace our older model. Plus we really want to use the 12” x 24” scanning facility. Our Brother Scan n Cut 2 arrived this week and we just couldn’t wait to get it open and get started with it. Are we happy with it – YES we are. That’s not to say our old machine will be relegated to the garage. It just means that the two of us can work with our cutting files instead of having to wait for one to finish. Love all the new features so check out the video below this video for a review and overview of our new Brother Scan n Cut machine. Thank you Wanda and Paula. I do not have a scan n cut but am very eager to buy one. Create n craft are selling the 350 at present with a very good offer and I was preparing to buy one when I read your article. I now realise that ,although it is a good deal, it does not really fit my requirements. I am primarily a sewer and quilter and I feel that the 650 would be a better deal for me. Will have to save a few more pennies!! So glad we were able to help Lee. This is the very reason why we wrote this article because we know that a lot of people wouldn’t realise that there are differences between the two. We didn’t when we first saw the new machine and like you, we were just about to buy the 350. I would have been very disappointed when it turned up, to find it didn’t have the features we wanted. I too wanted to upgrade and like you I did my research before making my purchase. The 350 is an awesome price but lacked the 1 feature I felt justified me upgraded to the 650, the ability to take my PHC files into the Scan n cut and seeing the dieline for applique cutting right on the screen. I purchased my 650 from a Brother Dealer in Mississippi as I do not have a dealer in my area. I have been very satisfied so far. I haven’t tried sending SVG files to the cutter yet but, I’m sure it won’t be long. Thank you for the update on the the Scan n Cut 650, Annie. We will certainly be getting the 650 when it is released in Australia. It has features that we will definitely use. In the meantime we have our older model which works perfectly fine, however, the wifi and being able to scan with the 24″x12″ mat are two of the features we are really looking forward to having. Thank you for the information about the (2) ScanNCut models. I wasn’t exactly sure why there was such a price difference between Amazon & the local retail stores here but the fact that there are different models helps me to better understand. I don’t currently have the previous version of ScanNCut or any other similar product and, right now, the CM350 has enough of the features that I’m interested in and will fit my current budget better — even if I have to pay extra for the online activation card. So that’s what I’m choosing the CM350 for right now with a thought to possibly upgrading later on as the technology improves. Great that we were able to help with your decision Pam. As you say, it’s all about knowing which features you need. Our older version works perfectly well and we use it all the time. But we will be getting the CM650 when it becomes available because we really want to be able to scan on the 12×24″ mat. And that wifi feature is going to be so helpful for all of us. I don’t know about you but we have our scan n cut in a different room to the computer, so it means remembering to take the usb backing the room to make changes. I too am planning on purchasing a Scan n Cut in the near future. Our Brother dealer has classes showing all the little tips and tricks for using one. And the classes are free and very well attended. Can hardly wait! Thanks for pointing out the differences in the 2 models. Just double checking… the activation card is just to make the 350 wireless for using with canvas? You can use a USB cable or stick to transfer projects from canvas to the machine? Thanks for sharing this information. Yes Melanie, that is quite right. You can still use your USB cable or stick to transfer the data. The USB cable is not included for either model. Thank you for this video. I was not aware there were two models and after much deliberation I realize that I need the 650 model too so thank you for putting out the differences between the two. Stop it does not read PES file it ONLY reads pes files that have been created in there software PE-Design or if you have a machine that reads PHC files also it is wireless only from PC into canvas program and visa versa not worth the upgrade except for the scanning and cutting 24 inches. The old one will still work with the brother machines that have the upgraded with the cut material feature in the machine the term pes readability does not refer to all pes files that you purchase be aware, my BIG MISTAKE!!!!! Thank you for this information Rose. We are unable to get the new models here in Australia so we only have the marketing material from Brother to go on. All the information available states that the machine is definitely wireless ready allowing you to transfer files from Brother Canvas Software to the machine and vice versa. Very good to know. That is the only reason I was going to buy the 650w. Starting to get very disappointed with Brother. I think they are getting to money hungry and not being straight forward with customers! I cannot begin to describe how disappointed and betrayed by Brother ScannCut I feel in their decision to bring out an improved machine with features that those of us who bought the original ScannCutCM600 etc series cannot have access to .. I refer you back to Mel Heatons original publicity for this earlier machine in which she stated that the Brother ScannCut original machines would always be the standard machine for ScannCut , and any improvements would be available for every user . I bought the machine in good faith on this premis and now not only do I feel really disappointed that I cannot access these improvements but I feel really foolish and naive to have been taken in by Brother in what I can only describe as a Scam . Crafters are supposed to be part of a friendly and kind fraternity and we have been taken advantage of .I can only imagine the disappointment of some innocent crafter who having saved up to purchase the original machine in August this year was a month later advised that her machine was already out of date . I realise it is not directly your fault at Alanda Craft , but you did ask for comments !! Yes Janet, a lot of people are upset with Brother. And I’m glad you realise that it is not directly our fault as we have absolutely nothing to do with brother, we are simply a couple of women with a craft channel. I live in Perth Western Australia and would like the MC650 machine and can’t find where I can buy one or what company will ship to Perth? Sorry Jenny, they are not available in Australia as yet, and Brother have advised us that they do not know when we are likely to get them. They have only just started to roll them out in the US. You can now get this machine in Australia from Echidna Club online http://www.echidnaclub.com.au/shop/CM900-ScanNCut-2-Cutting-Machine I’m slightly annoyed as I just bought my machine from there a couple of months ago and nothing was mentioned about a new model coming out. Grrr! I keep telling myself that I don’t need the new features….I’m just going to go and quietly sob now. Thank you for letting us know Domenica. Have you thought about asking the store where you bought your machine if they will trade it in on the new model. Just a suggestion and you don’t know if you don’t ask. Thanks. Definitely worth a try! Keep up the great work ? The machine on the web site http://www.echidnaclub.com.au/shop/CM900-ScanNCut-2-Cutting-Machine you mentioned is for the CM 900. is this another model or the same one as the CM650? I’m confused. I’m pretty sure that the CM900 is the Australian version of the CM650. They appear to have the same features. Have you ever purchased anything from this site before? I’ve never heard of it before & just want to make sure it’s a legitimate website.. Thanks ? Echidna are definitely a legitimate site so you should be quite safe buying from them. Do you know when and where i can get a universal pen holder for the scan and cut? Sorry Viv, I can’t help at this stage. Hopefully Amazon will have them soon. But they will probably be rolled out with the CM650 when it hits the stores. SO GLAD I DID MY RESEARCH FIRST & READ YOUR ARTICLE!!! You just saved me from a major disappointment & the hassle of having to do a return on an online purchase! 🙂 I don’t currently own any of the models, but I’m definitely adding the CM650 to my Christmas list this year! (If I can wait that long). Thank you so much for thinking of all of us, by writing this article- You’ve been beyond helpful! I live in the US, where/who is selling the CM650 mode? I can only seem to find the CM350 or the CM350 w/ Rhinestone Package online for purchase? Are they still just too new, to be widely available- even in the states? Thanks again! The CM650 has started being rolled out in the US. I believe they are available in Maryland but I’m not sure which other States have them as yet. One of our ladies commented on our YouTube channel that she had seen them in the Brother Sewing Centres in Baltimore, Maryland. You will generally find the top models in sewing machine shops, whereas large marts like Walmart will generally have the CM630’s. Hopefully Brother will have them in stores for the US market before xmas. As for us, well they still have no idea when we can expect them here in OZ. Hopefully it won’t be too long, we can’t wait to get our hands on one to review. Mahalo! I saw a demo of the latest model and like the wireless feature and svg files. Thanks for writing and clarifying between the two. Planning to get the 650 in December but it may not make it under the tree. How wonderful Linda, hopefully Santa gets the CM650 in time for xmas. I’m like so many of you that wish when we would purchase a phone, computer, car or a Brother Scanncut machine, could get home before the new model was advertised for sale. For those of us that have the 350, just wait and before you know it they will have a 950 and those that have the 650 will wish they would have waited, it’s a viscous circle. I’ve been very fortunate to have seen technology and it’s marvelous advances, but some days I wish it would slow down just enough for me to catch up, but it won’t, so just sit back and enjoy the ride. So agree Kenneth, technology moves on so quickly. The original Brother Scan n Cut works great, we use ours all the time. The new machine does have features that we want and we also need to do a full review using the machine for our viewers, but in reality, there is nothing wrong with having the older model. I have the 650W scan n cut 2, from Gall Sewing in Grand Rapids Mi. First machine, currently learning, but do like it. As with any computer program it is a learning cycle, and the technology is old the minute it is purchased. I just (as in two days ago) purchased the Brother Scan n Cut CM550DX. I was very excited about it but really disappointed that it doesn’t have the option to use with a computer. I’m a graphic designer and use my computer all the time and was hoping there would be an option to plug a USB cable into and run it from my mac. But alas that is not the case. And now I’ve just seen this new model that’s available and it has exactly the extra features I was looking for. There is no way I can now turn around and buy the new one after just spending a fortune on this one. I feel so disappointed. Well I have to say that if it were me, I would be taking it straight back to the store even if I had opened it and used it. They should have been aware that there are new models and at least told you and given you the option to buy the latest. It’s not acceptable to let the customer make an uninformed purchased. Unfortunately, I am finding this with most things these days. I do feel that consumers should be advised when it is close to a new release so that they can make an informed choice before they buy. After all there is nothing wrong with the older model and most people are quite happy with it. But for those of us who would find having the newer features an advantage, it is disappointing not to have been told about the newer model when it was so close to being released. Hi. I live in South Africa and having watched your’ video I am plan to get the scsnncut2 650. I all most bought one two months ago. Now I am so glad I did not just go for it. Through you vodio I now what questions to ask. Thank you. So glad we were able to help. Thanks for your review, I first read it a couple months ago and it was extremely helpful in understanding that as a papercrafter I clearly do not need the 650. That being said, I’m in Canada, and after research on my part I’ve ascertained that Brother will not be offering the 350 (or equivalent) in Canada at this time. The 650 just arrived at authorized Canadian Brother distributor stores mid-November for $599 CAD plus tax, and for those such as myself who want the lower end model, they are still flogging the original model which is called the 550 here for $399 nonetheless. I’m very disappointed with Brother that they are treating Canadians as such a foreign entity when I can literally walk across the border to the United States. While I normally try to buy local to support our economy, in this case I will be purchasing from the US. Thanks again for your helpful article! It appears Kim, that they haven’t just singled out Canadians, we have also received comments about this from our UK and OZ readers. Im sure that eventually they will roll out the lower end model everywhere. We don’t have it here in OZ yet and not sure when it’s likely to be released. But we have stores like Spotlight and Lincraft that only stock the lower end models, so one would have to think that Brother will need to supply them with what they need. At the moment though they just want to keep selling off the older models. And there is nothing wrong with those older machines, it’s only if someone wants the wifi functionality. We still use our older model. By having the two machines we can get twice the work done, which is especially helpful when putting together our bundle packs, as they are quite time consuming. Thank you for the great article and clarifications! Could you tell me if it is possible to use Cricut mats on the Brother ScanNCut2? I couldn’t believe how expensive their mats are? How long does a mat last? Why won’t the circuit mats work? No local store carries the scan and cut mats and each time they are shipped..they are damaged. Ugggg! The cricut mats won’t work in the ScanNCut because they are made for a totally different machine. The Brother ScanNCut won’t work in the cricut. Have you tried buying from Amazon. on the ScannCut2- They do show up on a computer though. Unfortunately Cherylo the model you have CM350 does not recognise .pes or.phc files. This feature is only available in the CM650W version. And even so, the C650W model only sees embroidery files that have appliqué data set. Hello and happy new year from a very windy UK. Thank you for your very useful information, which I will continue to access. I am in a quandary though. I am a sewer but not a reluctant quilter. I have a Husqvarna embroidery machine so not pes. designs. I have an accuquilt Go, sizzix big shot and accucut mark 1V as well as many dies, some of which I have had made specially for me. expensive business. I am so tempted to buy the CM900 which is just available through create and craft ( I have it in my basket!). I am struggling to justify buying one but adore the fact that I can design my own appliques and sewing patterns and not have to use scissors. My husband will say go ahead and buy it, then grumble that it takes up too much space. Do you think all my dies and cutters will be extinct if I buy this scan and cut machine? last question – does anyone know if it cuts mount board (that’s what we call the thick board for surrounding pictures in frames) , 5mm thick felt and balsa wood? It’s so difficult to advise someone about whether to buy the Scan n Cut or not because everyone’s requirements are so different. The ScannCut is great for applique because it allows you to cut your own designs without having to buy dies. So the cost saving is enormous when you compare to the Sizzix and Accu cutting machines. When it come to sewing patterns, personally I would just use scissors. A lot quicker than using the ScannCut. And I don’t believe your other cutting machines will become extinct if you buy the ScannCut. Each machine has it’s own place and the ScannCut can’t do everything. Thank you for your interesting blog. I have just purchased the universal pen tool for the scan n cut. I have searched the internet the whole day today and voila I found one in one of the posts above. Very interesting reading. I have a SNC 550 and live in New Zealand so we are even after Australia in getting the new version. I am very happy with my 550 though …just don’t have enough time to play with it!!! Its just so frustrating when you don’t have time to play. I am currently using the older model, and it works just fine. The later version does have some nice features, but my older model gets the job done nicely. Hi, does it work with tube scan n cut 1? Not sure exactly what you mean Susan. Which of the new features are you referring to. There are a number of features in the new Brother Scan n Cut that aren’t available on the older models. Hi, I bought the CM650 a few months ago, and I am just now getting the chance to play with it. I primarily purchased it to cut my fabric for applique. I mostly save my designs in the dst format onto a jump drive. Can I use the dst format to cut out the material on the snc2? As far as we know the Brother Scan n Cut only reads PES and PHC embroidery files, so you would need to convert the dst files to pes files for them to work. Hi, I am close to purchasing a scan n cut. I have the Brother Dream Machine (sewing). I mostly want to do applique cutting but am sure I will find many other uses. Do I need to have a computer program to make this work? I have Viking 6D. Will that work? Thanks. As long as you purchase the version of the Brother Scan n Cut that reads PES files then all you need is embroidery software that works with Appliqué data. (Assuming you are in the US this is the cm650). We know that Embird and PE Design work but we have never personally tried Viking 6D. But if it can read Appliqué data then it should work okay. I have just purchased the CM900 and have arranged to return it. The WiFi doesn’t work so I can’t transfer projects from the cloud to the machine. Also, canvas doesn’t allow me to upload any images other than the standard basics. Hope this helps. hello in one of your videos i noticed that you have a silhouette cameo. is the brother scan-n-cut better than the cameo, what are your thoughts i need something that cuts crafts foam. is this machine more for sewing and embroidery i want a machine that basically does it all. Thank you in advance. Well Patricia, Brilliant as these machines are, we wouldn’t really recommend either of them if your main focus is simply wanting to cut craft foam. Craft foam is soft and squishy and we haven’t had a lot of success with it. Either of these machines is brilliant for cutting card stock, paper and fabric, but There really is no one machine that does it all. The Sizzix Big Shot cuts foam reasonably well, but you need to buy dies to use with it and these can be quite expensive. I am interested in purchasing a Brother ScanNCut machine and looking over my options. I see that Brother requires you to purchase and activation card in order to connect wirelessly the machine to a pc. I can’t think of any other product that I have had to pay extra in order to connect to my wireless network in order to use, as most products have the features already built in without an extra cost. But is sounds like Brother has you either way. You either pay for the activation card to use wireless,or have to purchase a usb cable which is not included with the machine either. I am opting for the usb cable which will be much cheaper. Does anyone know where to purchase the usb cable for the ScanNCut machine? Also I was taking a look at the scanNcut canvas for creating my designs. So from what I understand I can simply save my designs I created in the canvas to my pc and transfer to the scanNcut via the usb cable, is this correct? In Australia, the activation card is built in so you don’t have to pay extra. Not sure why they made it an optional extra in the US. The USB cable should be available at any electronics store – it’s a pretty standard cable. We used the one from our printer. And yes, you are correct about the Canvas software. You can create and save designs in Canvas and save them to your computer and/or save them to the Canvas software. If you want to transfer the design to your machine you can WiFi it or if you have the cable attached you can also send it that way. Is this cutter have ability to cutting a sheet metal like soda can and can you mention the materials that the machine are cut and work great with it. and how mach the Cutting Force of the machine… Thanks for your support..
No Ali, it won’t cut sheet metal. The Brother Scan n Cut is designed for scrapbooking paper, yardstick and fabric. Sorry but I have no idea of the cutting force of the machine. This is designed for home use. So I need clarification because this point continues to be made vaguely, with one exception above, which I might have misunderstood. 1. Is it possible to WIRELESSLY transfer a file from the PC to the SNC2 directly, WITHOUT going through the internet/Canvas? Can you simply send the file from the PC through your own network/router, to the SNC2? 2. Is the Activation Card needed to find and add the SNC2 to one’s network? 3. Is the sole benefit of the Activation Card to use the Canvas editing and image library? 4. What format of files can be sent to the SNC2, FCM or course, but also SVG?, anything else? Or does everything need to be converted to FCM somehow? 5. The tutorials show people transferring files to and fro between PC and SNC2 using the USB cable and USB stick–is this as easy as it seems? As an aside, why on earth would one be able to send a file via cable and not be able to send it wirelessly, every other device can do that ie all wireless enabled printers, plotters, etc. (except for Cricut Explore Air because you can’t use the machine at all without going through DesignSpace, ie you must have internet, and you must be on the web, and you must be on their site called Design Space, you must have an account, and you must be signed in, to cut with the machine. You can’t save anything from Design Space to your own computer, it all stays in the cloud. The only benefit of the Blutooth feature in Explore Air is you can remove the printer cable between computer and cutter, the rest is the same). 6. One person stated above that one could NOT upload their own designs to Canvas, but the tutorials show one can, and does, in order to convert them and change/edit them, if they want to do that, in Canvas instead of other software. Now that you have the machine, what is true in your experience? 1. No, you need the activation card to do this. 3. You can use the Canvas software with or without the activation card. – The activation card is simply there to allow you to send files from the Canvas software to your machine. If you don’t have the activation card, then you can use a USB to transfer the files from Canvas to your machine. 4. The new Brother Scan n Cut 2 accepts FCM and SVG files (and PES files for the top end machine). The older model only accepts FCM files. 5. Yes, it does run quite smoothly whether you use a USB, a cable or WiFi. Only the new Brother Scan n Cut 2 allows you to upload files via cable, wifi or usb. On the older model you can only upload files via USB. 6. Yes you can definitely upload your own files to Canvas. They need to be either in the format FCM, JPG, GIF, PNG, BMP or DXF. Sometimes it won’t accept a file for whatever reason but in the majority of cases we have no problem getting files into Canvas…and we bring in a lot of files to Canvas. Oh thank you so much so much for such a clear listing of answers, I could just kiss you; hope you’ll settle for a long distance hug. Very clear. Thanks. Hug gratefully accepted lol. Happy to have been able to help. Hi I it seems most the problems are the fact brother bought out a newer model . Any of the Brother ScanNCut models will successfully cut paper. The newer model has some added features such as wifi, etc. But they both work the same when it comes to cutting. I would certainly recommend the Brother ScanNCut for paper craft. And it has the added bonus in that you don’t have to buy extra dies as you do with some of the other paper cutting machines. Also and just as importantly, thank you for all your videos and blogs regarding the SNC2, you have been very helpful, very helpful. I got really confused by the 2 new versions. I need a machine that can scan and cut 12*24. does the mat is suitable for all machine types or just the 650? You can use the Brother Scan n Cut 12’x 24″ mat to cut out patterns on all the Brother ScanNCut machines. However, you can only cut out but not scan using the 12″ x 24″ mat on the older machines. To both scan and cut using the full range of this mat you do need the CM650 machine. It will scan and cut A3 page sizes. On the machine itself, you can only bring in .fcm, SVG or PES files (depending on the version of the machine). And you cannot output anything to a JPEG. I am from Belgium, I would like to know what is the difference between Scan n Cut cm840 and cm900? Thank you. It’s a bit hard to for us to tell Cindy as we don’t have the cm840 in Australia. But the cm900 will more than likely have a wifi symbol on the machine. The older machines and the less expensive models won’t have wifi. I checked the Brother website and the cm840 looks like our older machine but it was a bit hard to tell from the photos. But if you want the top of the line then the cm900 is the one to go with. We use both our machines, as the older model does the same job when cutting out files. Did you figure out what the difference is? Hi – thank you for your post – Im from Denmark , and have debating with myself weather I should buy Cameo Silhouette or Brother Scan’N’Cut 900. My only use is to make stickers for my planner ( Happy Planner ) , I have already designed and printed on adhesive paper, so it would be very easy to scan and cut it on the BSNC. My Question is – Do you think the scan/trace / out-line ( what is called ) function work as good as the silhouette . Sorry my poor english I hope you understand. To be honest, I couldn’t really say which one is better. We’ve had more experience with the Brother ScanNCut so we know what it can do but we haven’t played around enough with the Silhouette to provide you with a suitable answer. Sorry I couldn’t be more helpful but we don’t want to give you the wrong advice. I just purchased the 350cm from HSN and am sending it back. I watched your video and found that the 650cm is a much better buy for me. I just need to find a dealer close to me in Arkansas. Will this work with my Janome MC 15000? Sorry I forgot to ask. The ScanNCut only recoginzes PES files which only works with Brother machines. We are going to be testing the process with our Janome at some point to see if there is work around. It looks like the top of the line will be the cm900. 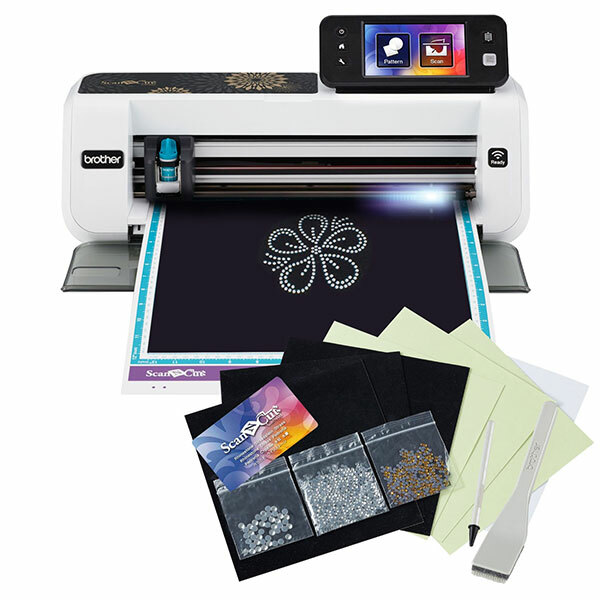 Here is a link to Create and Craft, they are selling this model for £499 http://www.createandcraft.tv/pp/brother-scanncut-cm900-machine-341402. Hope this helps. The only way your machine will see a PES file is if it contains applique data. So what you need to do is find machine embroidery designs that use applique data as part of the design. To be honest, we have only had a very minor play with the PES functionality in as much as we managed to find some embroidery designs that used applique data. They were recognized by the ScanNCut, but that is about all we have done at this point. We will be doing a ScanNCut Fabric course fairly soon which is when we will be getting into more detail on how it all works but for now, I have to agree with you that Brother should have provided more info on what was involved with using PES files. There is only one scanning mat and that is the photo scanning mat. It is not necessary to have the photo scanning mat to scan. A lot of people don’t buy the photo scanning mat as they can just use the standard mat, medium tack mat or low tack mat. The reason most people buy a photo scanning mat is to scan delicate documents and photos that they don’t want to risk damaging by using one of the sticky mats. We don’t know of any suppliers in Puerto Rico, you need to check out the dealers with Brother ScanNCut here is a link http://www.brother.com/brgnet2/. We are not affiliated with BrotherScanNCut. I did a quick search online for craft stores in Puerto Rico that may have the Brother ScanNCut but didn’t have much luck. EBay is another option you may like to try. I am new in this adventure. I would like to know about the supplies for the CM650 model. Can I use the vynil used for signs or what kind of vynil it supports? Can I make signs? What’s the biggest measure? Can I make my own designs such as logos, invitations, etc? Does it supports .jpg format or what format? Where can I found the supplies? The ScanNCut can cut vinyl but I’m not sure whether it can cut vinyl used for sign making. This is not an industrial machine so it does have it’s limitations. It will depend on the thickness of the vinyl. You can definitely make logos and invitations and the machine uses a .fcm format, but if you use the online free ScanNCut software you can import .jpg images and convert them to .fcm, although some images work better than others. You can also import SVG files into the new machine. You can find supplies online on eBay, Amazon and offline at crafting and sewing stores. Not that I am aware of. Although it’s a bit hard for us to comment on this as we do not have a Brother Embroidery Machine. The only way it will work is if your embroidery machine can read .fcm files. The scanNCut 2 will cut vinyl 12″x12 but why can’t I cut vinyl up to 10′ long like the Silhouette? I’m also down to the Brother ScannCut CM900 or the Silhouette Cameo 3, which of these are best for cutting mountboard? I’d also like to know if I can use Cricut/Cameo pens in the SNC? I’m just assuming that mountboard is like a very thick card stock. If yes, it could cut it but too difficult to say without us testing it. I don’t want to give you the wrong advice. It will really depend on how thick the mountboard is. As for the Cricut/Cameo pens, no you cannot use them in the ScanNCut. Is infernet required to use rhe Scan and Cut 3? 350 model. If so, can i use the usb connection for my phone instead of a computer. Scan N Cut 2, 350 model. No Brooke the internet isn’t needed for any of the ScanNCut machines. It’s just an additional feature on some machines that can be used to transfer files rather than using a USB. But every other function for the machines does not require the internet. I just went to check the exact measurements for the A3 size and it is 11.69″ x 16.53″. The Brother ScanNCut mat is 12″ x 12″, however you can get the extended version of the mat which is 12″ x 24″. So I would think that an A3 size would fit the longer mat. I’m not sure what country you are in so it’s difficult to give you advice on what is the best version. In Australia, we have the CM900 and the CM700. The CM900 is the more expensive version and has the added features. It might be worth you asking Brother.com directly as they may be able to give you more detailed advice for your country. The activation card in Australia is built-in to all the machines. In the US you have to use an activation card in or to get the wifi working but in Australia no card is needed. I would like to know how the Brother ScanNCut machines are on cutting circles ? Is the new version better than the old one ? Circles cut quite well with the ScanNCut. I haven’t noticed any difference in terms of cutting with the different machines. Both the old and newer models cut the same. I am trying to tell my husband what I would like for Christmas. I am a paper crafter as well as a wool applique and quilt maker. I really am not very techie and just really want a machine that will cut out my pieces and be able to enlarge and manipulate the pattern. Which machine would you suggest for someone from the US? What an awesome Christmas present Linda. You are going to love it.All versions of the Brother ScanNCut will cut out paper and fabric. They all work the same. The high end machine has wifi connectivity to send files from the online software to the machine, and a couple of other features. We still use our really old ScanNCut and it works just the same as the newer machine when it comes to cutting out. Here is a link to Brother US where you can check the difference between the two machines https://www.brother-usa.com/ScanNCut/Product_Comparison.aspx. Why everyone says that the tackines of the mat is gone after 2 or 3 uses? I am from Bangladesh and I am a paper crafter. I was thinking of buying the scan cut 2 but this is my concern. It does lose its tackiness after a few uses but all you need to do is clean it with wet wipes and it will become sticky again. Here is a link to our video on this http://www.alandacraft.com/brother-scan-n-cut-tutorial-extending-the-life-of-your-cutting-mat/. does it works Embossing or not ?? does it works on Etched Metal Jewelry Emboss Stippling ??? for eample put one letter of my first name or hart shap ?? Are there special tools to work as Etched Metal Jewelry Emboss that we can buy it ???? how can we diy Embossing folder with scanncut machine ?? for example put one letter of my first name or heart shap ❤?? can it create stamp ?? what we need to create own stamp ?? Yes it can create stamps, and there is a stamp making kit for it. We have ordered one but are still waiting for it, but we will most likely record a video for it when it arrives. 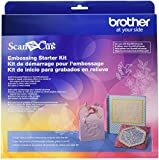 There is an embossing kit available for the ScanNCut. However, we haven’t tried it yet so can’t really tell you how well it works or whether it will work for jewellery. I have seen a couple of videos on YouTube demonstrating it, so you could give that a try. I know this is really off off topic.. but i need help. We are selling our CM350 on Ebay and was wondering if the activation cards can be re-used by a new user. If so, how do I de-activate, or do they simply get my login info to continue to use them (yikes). Any help is appreciated, still waiting for an answer from Brother support also. I think you can deactivate the card, but I don’t want to give you the wrong advice. So to make absolutely sure and to check out how to do it, I suggest you contact Brother directly. Here is a link to their customer support line. https://www.brother-usa.com/askus/default.aspx?PGID=30&R3ModelID=CM350. How is the 350 at cutting wool? I’m looking at the 350 and will be using it for paper but also would do a good bit of fabric (including wool) cutting. I haven’t cut wool fabric as I using quilting fabrics. You would need to be sure the weave wasn’t too loose and the fabric wasn’t too thick. Without knowing exactly what you are wanting to cut, I can’t really you advise you. If you are going to buy one to cut paper then you can always do a test cut to see how the machine handles it. The silhouette files are in a different format to the .fcm files that are used by the ScanNCut, so you would need to convert them somehow. Just search for ‘Convert Silhouette files to ScanNCut’ in Google and you will find some links to others who have done this already. Hello. I am trying to decide which machine to buy, but a big thing for me is will this machine cut leather and thin balsa wood? I had my eye on the Pazzle, but the ability of the BSNC not having to be connected to the next all the time gives me all the good feels lol. In your experience, is the BSNC capable of cutting these items? *Please note that they depends on materials you are going to cut. We have this on our to do list of videos.